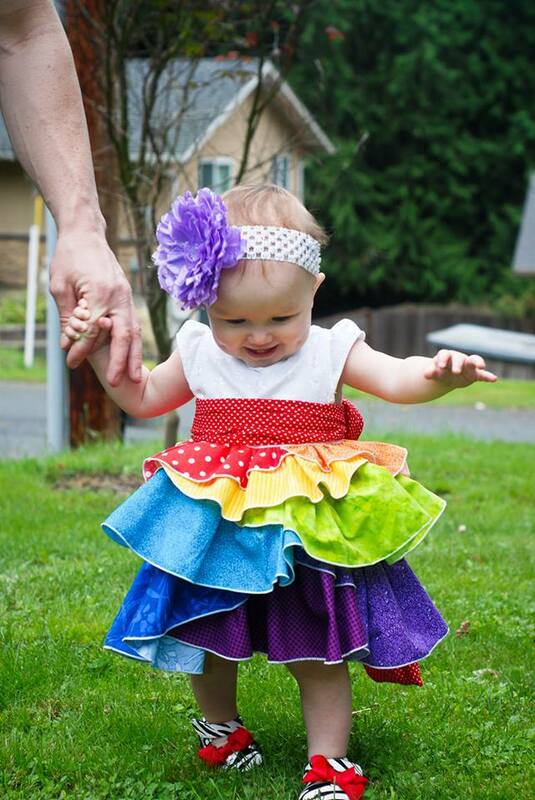 Baby Girl Turns 1 Rainbow Style!!! – Everything Your Mama Made & More! I can’t believe it is already here??? 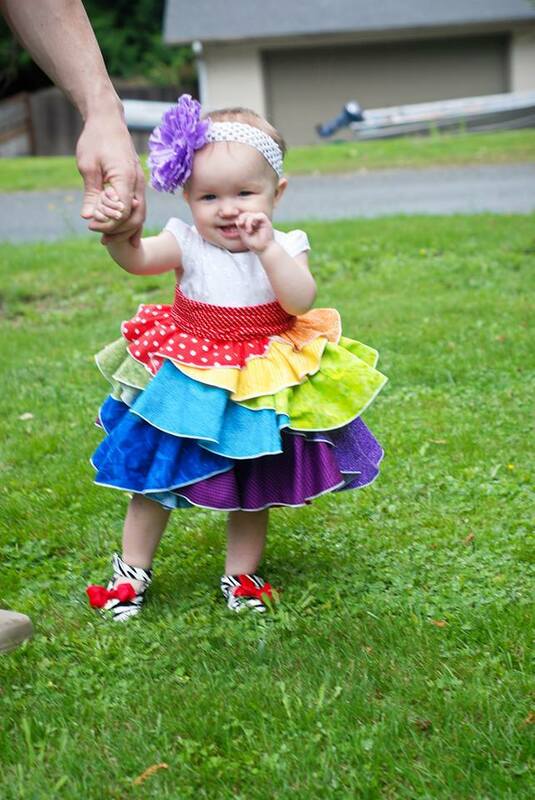 Today my surprise baby girl Kenzie Rae turned 1! Unfortunately I seriously messed up both my knees over 2 weeks ago running in bad shoes :(. 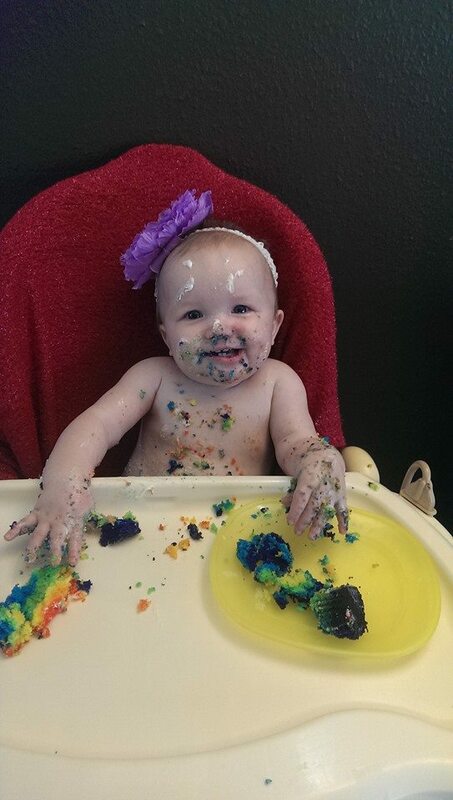 I wasn’t able to do nearly as much as I wanted for her party because I really couldn’t walk with out strong meds until the day before the party. 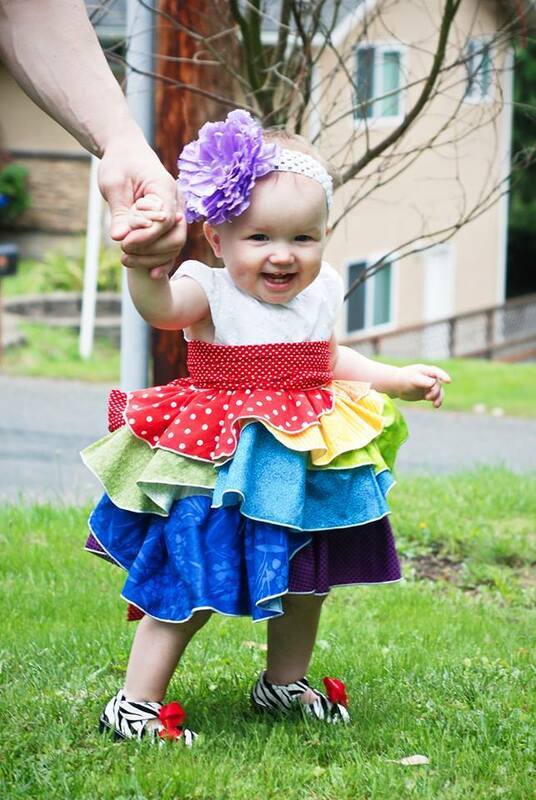 That being said Saturday night & Sunday morning I worked on and finished her birthday dress based on my ‘Over the rainbow inspiration’ sketch. I was good & made paper pattern pieces as I went in hopes of getting around to creating a pattern for it soon. Enough chat time for some pictures! 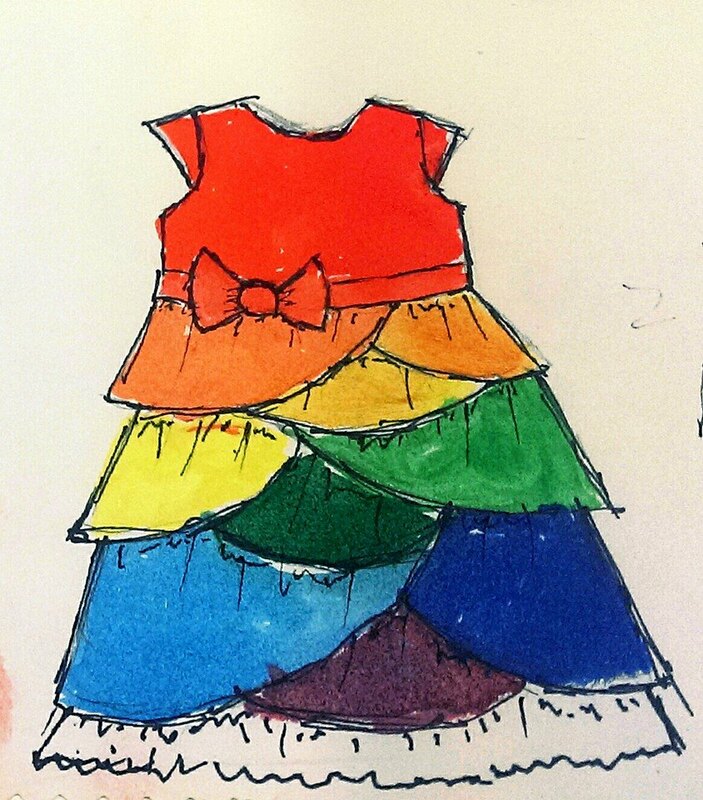 This was the original idea or inspiration sketch! I was inspired by the skirt on this dress by Paradin’ Around Boutique. She used random layers of curves between regular layers. I decided why not do ALL random curved layers and a more classic bodice with a twist (the back is stunning, pics coming soon). I did skip the bottom ruffle, switched out the bodice color & put the bow on the back instead compared to my original sketch, but otherwise I think I got what I was aiming for! These aren’t the best quality pictures but I was working around a walking 1 year old & a photo bombing 2 year old and rain, lol. I hope to get more pics including the scooped back & sash bow. Unfortunately most of the people who planned on coming to the party got sick (3rd week of school is a bad time for parties!) so it was small but nice. I didn’t get any real decorations done but I did make her a big rainbow cupcake with lots of white fluffy frosting & rainbow sprinkles! She dove in so fast she actually got a tiny burn on her face from the hot wax! CONGRATS on your baby turning 1!!! 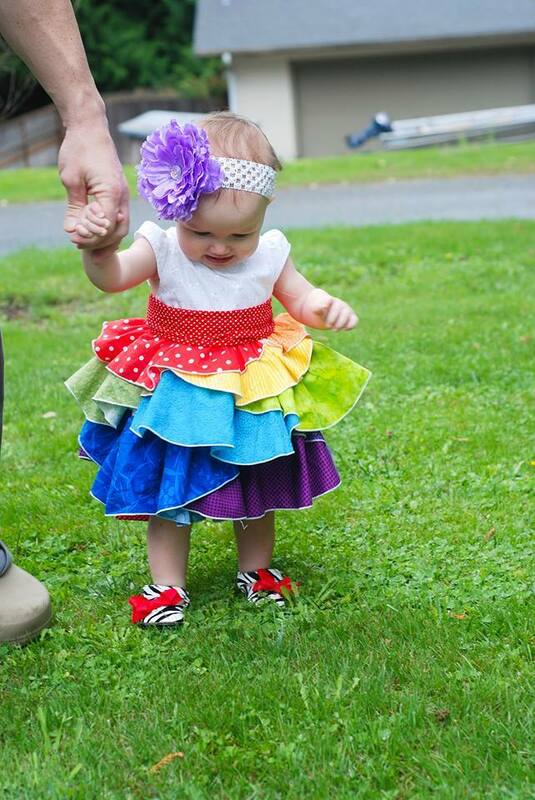 You are very talented… the dress is very cute and your beautiful daughter makes it even cuter :0). I hope you feel better soon.